Giving exceptional students an opportunity to develop professional skills and substantively engage in peace negotiations, post-conflict constitution drafting, and transitional justice planning as young professionals. The Lawyering Peace Program was founded in 1998 by Law and International Relations Professor Paul Williams at American University. Professor Williams firmly believes that good lawyers are crucial to developing a durable peace in conflict and post-conflict countries. Given his expertise in international law, Professor Williams was frequently engaged in advising parties to peace negotiations and post-conflict constitution drafting. He realized that working on real-world legal issues was essential in preparing young lawyers who wanted to make a difference in the world, and began engaging them on projects related to questions and challenges his pro bono clients were faced with in the field. What work will you do? 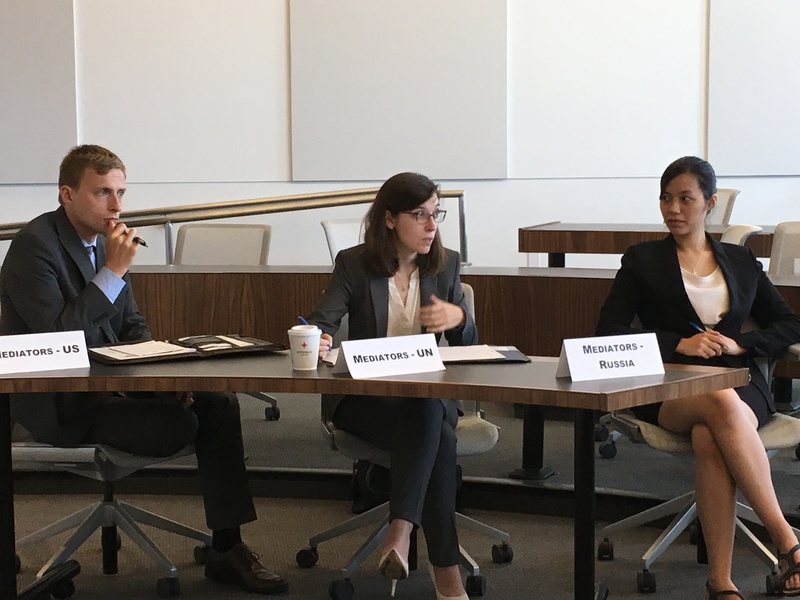 Lawyering Peace students will work for a period of one semester on a semester-long research project, drafting client-ready memoranda or other legal documents on international legal issues. Students research everything from strategies for peace negotiations to international best practices for the structure of post-conflict justice mechanisms. Burma: Students assist in work with civil society organizations to increase support for the peace process. Kenya: Students provide support to civil society organizations and government institutions in Kenya to address accountability for post-election violent crimes and politically motivated human rights abuses. Syria: Students support the work of counsel in providing legal assistance to the moderate opposition Syria National Council related to peace negotiations, ceasefire agreements, post-conflict constitution drafting, and transitional justice. South Sudan: Students work with international organizations to assist civil society and other stakeholders in South Sudan to increase and coordinate their documentation efforts. Tanzania: Students provide support for civil society and government-led initiatives to counter violent extremism and understand its causes at local levels. Yemen: Students provide support to civil society groups in building capacity and promoting engagement with the peace process and its implementation. Iraq: Students provide assistance for projects with local and other international organizations to build the capacity of local Iraqis to document human rights violations. Sudan: Students provide assistance to the Sudanese peace process. Sri Lanka: Students work with civil society partners to build capacity for human rights documentation work, transitional justice initiatives, and impact litigation. Lawyering Peace students will take Professor Williams’ class, Advanced International Law and Peace Negotiations, in which students will have the opportunity both to learn legal concepts relating to peace and conflict resolution and to improve negotiation skills. The Lawyering Peace Program has a strong professional development component. Students have the opportunity to network with alumni of the program and to practice their negotiating skills in numerous intensive negotiation simulations throughout the semester. Where have our alumni worked? Our students have access to a network of over 700 alumni, who now work in a wide variety of organizations in the public and private sector. Interested in international law and relations at American University? Join our community on Slack!